Leucillin Antiseptic Spray for Animals is specially formulated for the equine and petcare market, it provides a high strength healthcare solution you can rely on; this 100% safe, non-toxic, one-step topical pathogen control spray. Leucillin is a unique antiseptic which cleverly mimics the body’s own immune system, Leucillin replicates the leukocytes (white blood cells) naturally produced chemical used to fight infection caused by invading pathogens (germs). 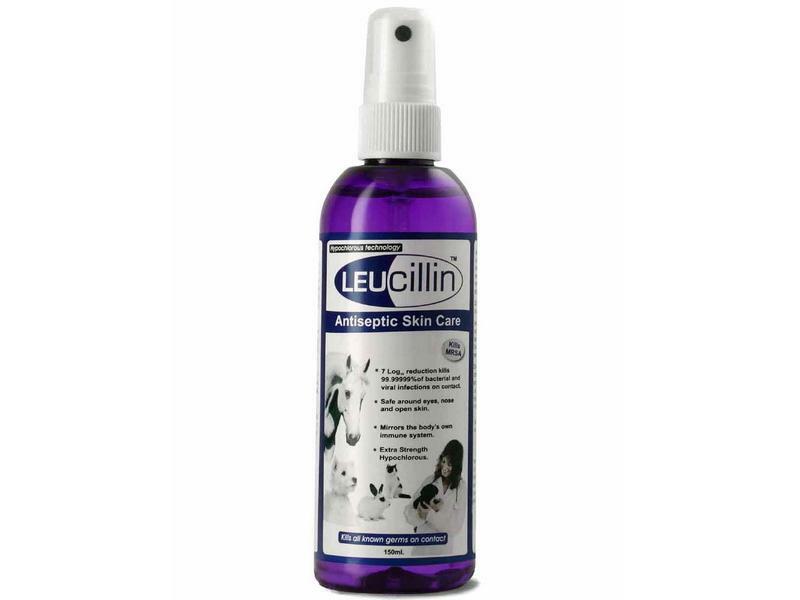 Leucillin is a natural antiseptic, destroying harmful germs on contact allowing the skin to heal naturally. 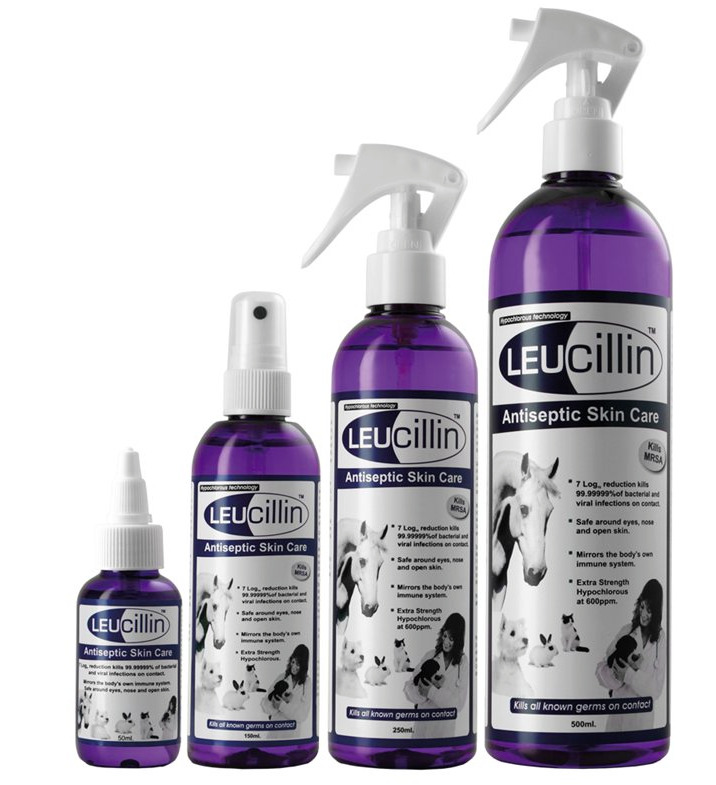 Below are some recent questions we've received regarding Leucillin Antiseptic Spray for Animals, including answers from our team. My husband is undergoing chemotherapy and I am trying to reduce any infection risk. We have a little dog who loves going out for walks but we now need to be extra careful careful she does not bring bacteria and germs back into the house so I am looking for a quick easy and Stressfree solution to quickly treat her paws. Would this be suitable? Yes this is 100% safe to use on your dog's paws before going back into the house. Over the past few months my dog has started to suffer with Eczema under her chin. I have had various treatments from the vet but nothing has worked. I'm not so sure this would work as it is mainly for cleaning wounds. If the area is inflamed or infected then it would help kill germs, but it won't soothe the skin or deal with the cause of the eczema. A topical cream would be much better, but your vet would have to advise on this. You could always try a skin supplement such as Yumega which contains omega oils specially selected to help maintain a healthy skin and coat. This would definitely be worth giving a go. Ringworm is a highly contagious skin infection caused by a dermatophyte fungus. 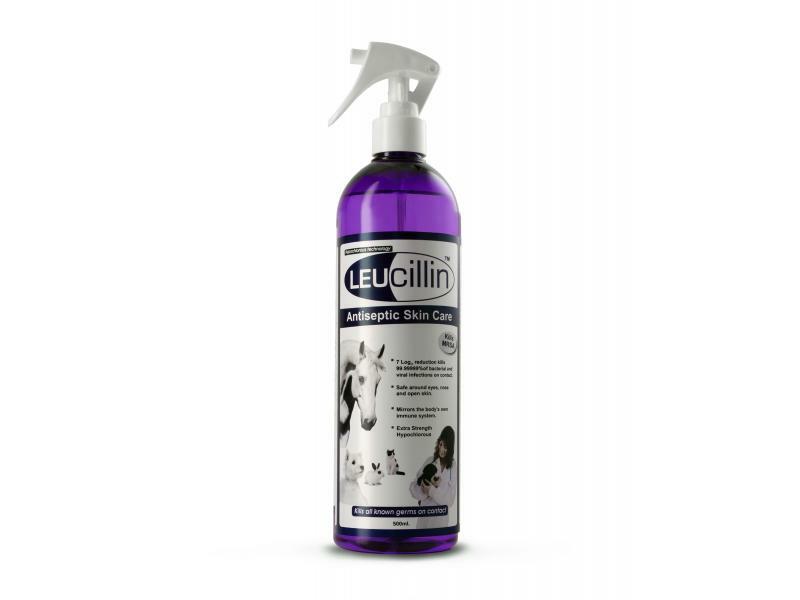 Whilst Leucillin Anti-bacterial spray has anti-fungal properties it is not clinically proven to be effective against equine ringworm. Imaverol is the standard treatment for equine ringworm and is very effective against the main types of dermatophytes that cause ringworm. Yes certainly it is fine to use like that. After aspiration the limp has developed round raised lumps that sometimes bleed. The vet says it is mast cell and cannot operate because not enough skin to close. So I have been using saline when redressing daily or every other day. Some of the sores look crater like now but don't really bother the dog. It is swollen but I can't get swelling to decrease but it isn't getting bigger. Will this spray help keep the area clean and free from infection. Is it safe on the open sores. This is a good spray for the situation you describe. It is safe on open sores and is generally effective at helping to suppress any surface infection. It will probably help and is safe to use, though yeast infections generally have some pre-disposing, underlying cause which you might be able to treat too. It might be worth talking to your vet about that, but this product is very safe and does have anti-fungal properties which are effective against yeast organisms. 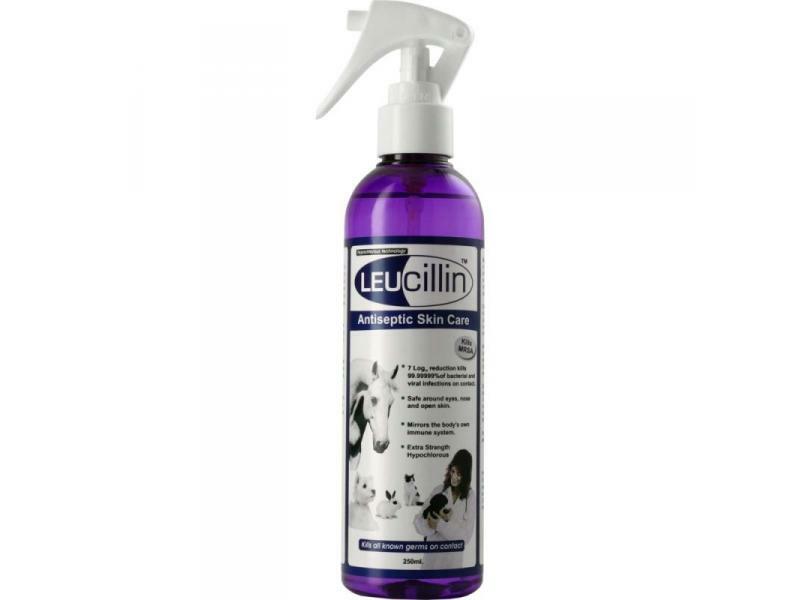 Hi is Leucillin spray safe to use on ducks. One of my ducks has a scratch wound in her back caused by an over amorous drake and she is not too keen on me cleaning the wound every day, I was wondering if Leucillin would help it heal faster. thanks. 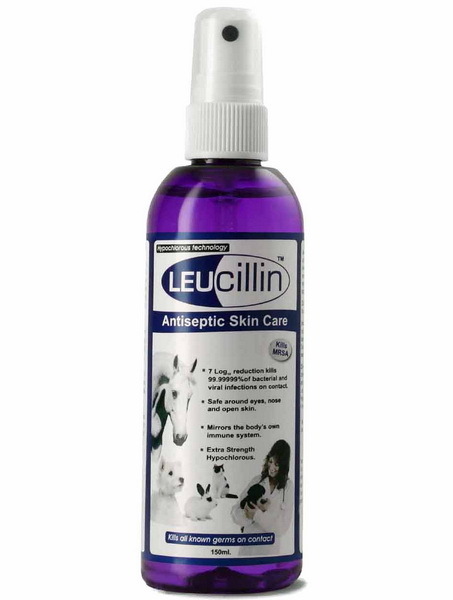 Leucillin is safe to use on ducks, it is safe for all Mammals, Birds and Reptiles. Spray the duck's scratch liberally, don’t dry or rinse Leucillin, leave it to dry naturally. Spray a couple of time a day until healed over. a build up of hard crusty residue forms on the eye lids. What can I best use to remove because the dog finds washing etc, very painful.? Regular washing with a non-irritant product is the answer. Probably this will need to be done daily. If any dry discharge has built up then this needs to be softened by being kept moist for a minute or two before trying to remove it. You might find that the antiseptic properties of Leucillin help, or a simple wash such as CleanOcular could be safer to use long-term. This is a safe product to use and can be sprayed over the (closed) eye. If there is any discharge from the eye, it is very helpful to wash and wipe this away. Some of the solution will get to the conjunctiva and it should help to combat the infection. If in any doubt, always get your own vet to check the eye. 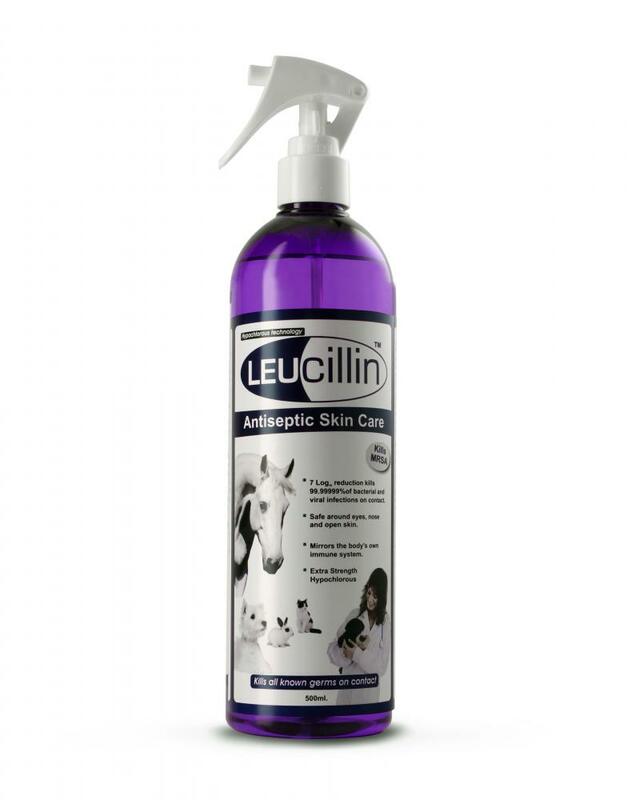 My dog (labrador) has a red, itchy ear can Leucillin spray be used in the ear of Labradors? From what is said about the product it should be safe. Dogs tend to hate anything being sprayed into their ears though, so you might be best not to apply it that way.